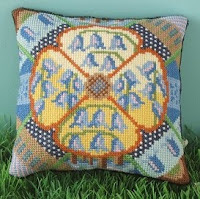 This latest mini cushion was originally designed for a magazine commission. I was asked to design a spring mini cushion and I produced two designs. The magazine was taken by both but chose the other one as it was more in keeping with the theme of the magazine for that month (will mention that one later in the month!! ), so I've put this design to good use making it into a kit. There are contrasting parts to this design - we have close-up images of the bluebell flowers and then more distant views of full carpets of the flowers in the woods with tree trunk rising up from floor. A palette of Spring-like colours of pale yellows and blues feature but there is also a splash of midnight blue and twinkling white stars looking over the Bluebell Woods at night.